The MGX-21 is the most unconventional, rich and technological of the 1400 cc grand cruisers built at Mandello del Lario. It is the distinguished representative of a line begun in 1921 when Moto Guzzi started building unique motorcycles, strictly assembled by hand, as unique collector’s items. Moto Guzzi is one of the greatest brands in the motorcycling world and in almost a century of history has produced motorcycles that are often ahead of their time, forging new ways forward subsequently adopted by everyone. From the racing track to the streets of the world, the company has not compromised its Italian soul. Backed by universally recognised values, Moto Guzzi can now express the influences and stimuli of motorcycle culture in an increasingly personal and exclusive style. 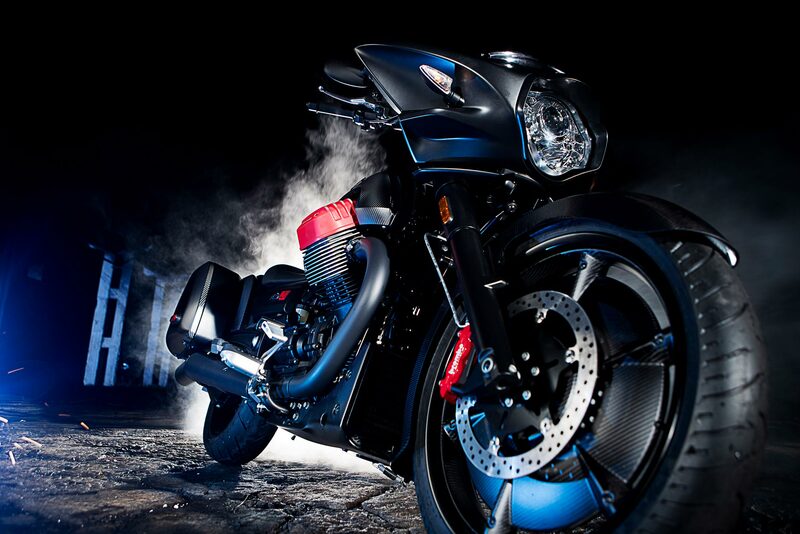 The MGX-21 is the latest example of Moto Guzzi’s originality and courage, a traditional part of its heritage. The MGX-21 is dedicated to lovers of exclusive motorcycles, to people who know how to get excited even before they embark on a journey, simply by giving themselves over to the majesty that this prestigious Italian bike emanates, even from a standstill. The MGX-21 seems to invite you to fasten your helmet and set off, heading wherever the map takes you. This Moto Guzzi offers a different and unique way of looking at a bike trip: it is not just the body that is transported, but it is the rider’s soul that is involved in a beautiful and emotional experience. It is the sensation of perfect harmony with a muscular looking motorcycle. It is the purest essence of the voyage itself, made up of adventure, freedom and discovery. The internal trembling and vibrations felt even before you climb on board, multiply when the 90° V-twin engine starts up: from the banks of the Lario to the borders of the world, your journey moves to the rhythm of the strokes of the huge pistons of the Moto Guzzi big block. The immediately obvious aspect of its appearance is also wholly exceptional: the technical and stylistic features of the prototype, which had surprised everyone at its first presentation, have been kept totally intact. 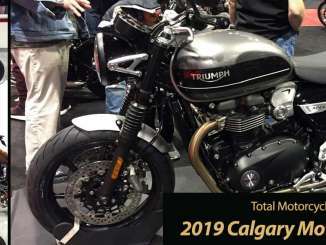 This is not a marginal detail, given that very important changes are usually made between a prototype version of a motorcycle and the final production model. Indeed, in the case of the MGX-21 a considerable detail has been added: MGX-21 has become a large touring bike, with a pair of rigid side panniers that in no way distort that purity of design the prototype boasted, integrating harmoniously in the style of the back end. The 58-litre carrying capacity and the presence of convenient, removable internal bags guarantee space and practicality for world travellers. The external pannier covers are in carbon: the deep reflections that come from the fibre are combined with “total black” graphics that make the MGX-21 the darkest and most attractive bike from Mandello. This is a bike dedicated to those who appreciate fine aesthetics, the stimulating touch of the surfaces when they are caressed and the alternating volumes and textures that delicately explore the sensibility of a design rich in content. The design of the MGX-21 leaves little room for indifference and, like all Moto Guzzis, begins by showing of the engineering of the big 90° transverse V-twin engine with two large cylinders that seem to literally explode out of the petrol tank, helping to make the side view considerably lower and streamlined. The red paint of the aluminium head covers emphasises the power this engine is capable of expressing, even in its aesthetics. Low in the back and raised at the front, MGX-21 tells you from the first glance that it is capable of eating up the miles smoothly. It’s certainly no wallflower, but rather seeks to attract people’s attention with its original shape and the mysterious nocturnal appearance created by the PADC (Piaggio Advanced Design Center) designers in California who conceived its look. Particular attention was given to the study and definition of the “batwing” design, the large top fairing that makes an essential contribution to the bike’s futuristic look. Form and function once again come together in perfect balance: the careful fluid dynamics analysis with CFD (Computational Fluid Dynamics) simulations and the numerous test sessions in the wind tunnel have led to achieving optimum air protection capacity, a quality that a bike destined for long trips must possess. The shapes at the back also stem from the same studies and they are enhanced by carbon profiles and the dual series of built-in LED lights. To celebrate such a personal, powerful and brave style, Moto Guzzi gave the MGX-21 the evocative soubriquet of Flying Fortress. The Flying Fortress also stands out for meticulous and obsessive attention to detail: the spectacular headlight cluster uses LED DRL lighting technology, whereas the electrical controls on the handlebar are finished with metal shells. While respecting the solid century-old tradition, the MGX-21 reaches out to the future, employing materials typically used in the most advanced sports motorcycles. In fact, numerous parts are made of precious carbon, such as the front mudguard, the fuel tank panels, the side pannier covers and the engine cover. The MGX-21 shows off a large 21″ alloy front wheel, now protected by lenticular carbon covers with small openings where the spokes intersect with the channel. This stylistic choice also brings the technical advantage of increased stability and ease of handling due to the passage of air from one side of the hub to the other while the bike is in motion. PIOGGIA is the map suited for low grip conditions, decreasing the torque and engine brake management. 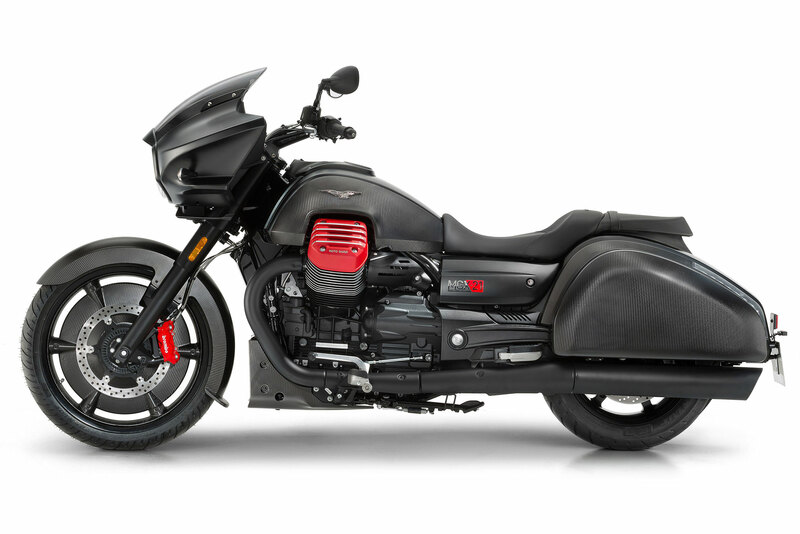 Moto Guzzi MGX-21 is also fitted with two-channel ABS and an advanced (and patented) traction control system that can be adjusted to three different settings (that can also be disabled). The cruise control from Moto Guzzi with multiple features makes its début on the MGX-21: this system allows the rider to maintain the selected speed without touching the throttle, as well as increasing or decreasing cruising speed using a toggle button on the left-hand handlebar control. The speed can be temporarily increased by twisting the throttle; once released, the bike returns to the cruising speed. The system disengages automatically, not only by braking or pressing the selector switch, but also by twisting the throttle in the opposite direction. Once disengaged, you can return the bike to the last cruising speed set simply by pressing the “resume” button. The top fairing hides a highly refined instrument cluster with a monochromatic, dot matrix display with a wealth of information, also including the fuel level and engaged gear indicator, clock, average and instantaneous fuel consumption and air temperature indicator. The MGX-21 dashboard also provides a complete entertainment system that includes the stereo system, equipped with an AM/FM radio with a 25W per channel amplifier connected to a pair of loudspeakers and it manages the intercom system. A Bluetooth module, that can host up to 5 devices, and the USB socket guarantee complete interaction with external devices, including a smartphone that can be used as a music player or to manage the multimedia platform, also included as standard equipment. MG-MP is the Moto Guzzi system that lets you connect your smartphone to the vehicle to transform it into an exceptional source of useful trip information. MG-MP is also able to handle telephone calls (answering and hanging up through the handlebar buttons) and it can use the smartphone’s voice recognition features to place calls or activate a playlist. Therefore, a bike that supports the rider with cutting-edge technologies so he can tackle his trip with complete peace of mind and get the most possible enjoyment from the riding experience in full safety and control. The adoption of the 21″ front wheel led to a major evolution of the frame that ensures high levels of comfort and riding pleasure. 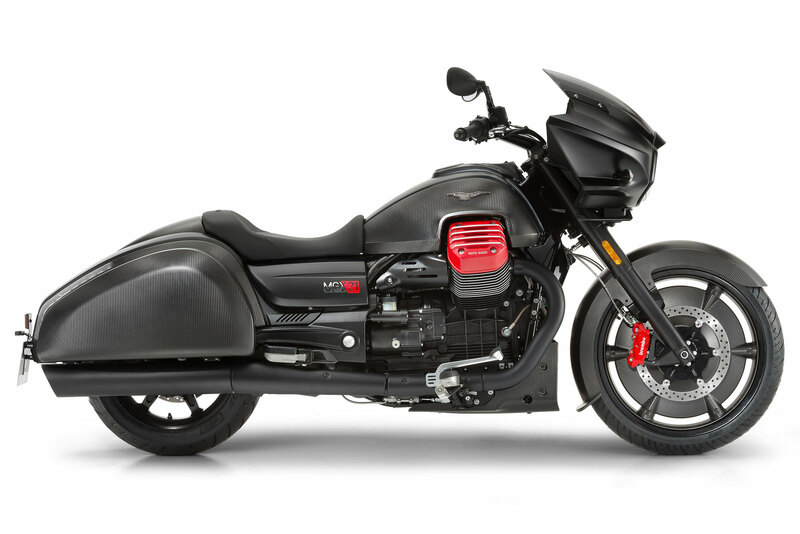 Moto Guzzi has developed a steering geometry that ensures balance and ease of riding, admirably reconciling two qualities: the comfort and load capacity of a custom with the dynamism and performance of a cruiser. Also contributing to achieving this goal is the patented manoeuvring assistance system that reduces the tendency (connected to the size of the front wheel) of the steering to “close” in low speed and high steering angle manoeuvres, counterbalancing the weight of the steering, thanks to a system of regressive springs and particular kinematics. Another aspect of the MGX-21 that was given particular attention is the riding position. The two high semi-handlebars that lean toward the rider, along with the forward footrests and a very comfortable seating position just 740 mm from the ground, ensure a dominating posture in the saddle that is comfortable and extended for the back. This way the rider has total vehicle control, both at a standstill and in motion. Luxurious and dark, the flagship of Mandello can comfortably seat a passenger or be enjoyed alone. In the case of the latter, the portion of the saddle dedicated to the pillion can be easily removed so you can travel like a solitary knight in perfect harmony with your mount. 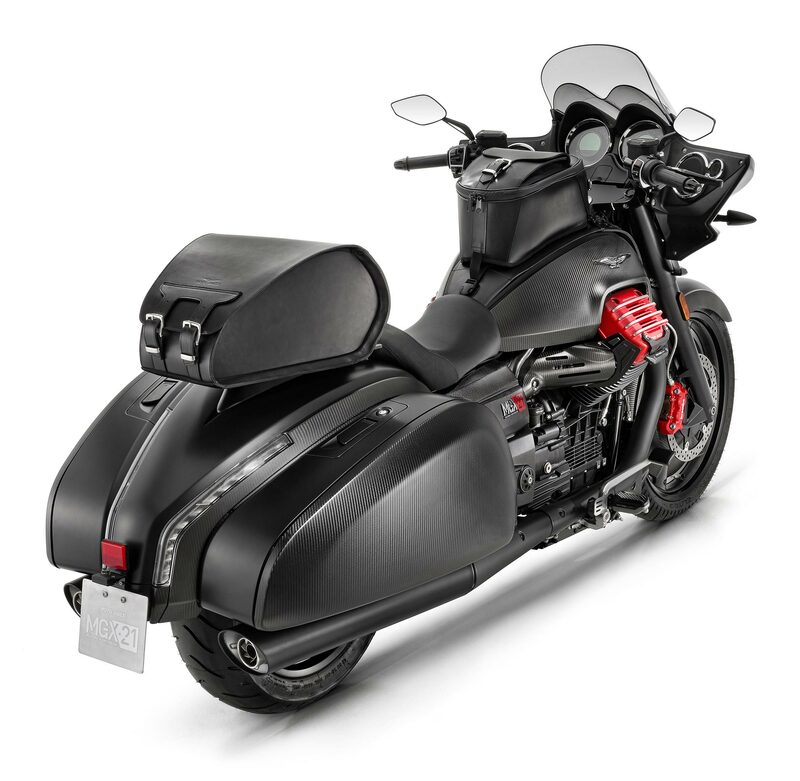 In place of the passenger saddle, you can install a carbon fibre cover or the topcase mounting bracket, both available in the rich Moto Guzzi accessories catalogue dedicated to the MGX-21. The closed double cradle tubular frame structure, stiffened thanks to larger diameter tubes in the front section and reinforcing plates in the rear part, uses the ingenious elastic-kinematic engine mounting system developed by Moto Guzzi to eliminate the vibrations transmitted to the rider when rider. Nevertheless, at a standstill you will still feel those pulsations generated by the powerful action of the two 104 mm diameter pistons in the Moto Guzzi big block that excite even the most experienced biker, amplifying the “living” character of this motorcycle. The largest V-twin ever produced in Europe, which can deliver more than 120 Nm of torque with ease and precision from very low revs, has earned EU4 certification and an exhaust unit with very long horizontal terminals. It is an ultra-modern powerplant, characterised by four valve per cylinder heads, driven by an overhead cam per bank through a system of rockers and rollers in order to reduce losses due to friction. The modern character of the engine is also demonstrated by dual ignition in order to guarantee perfect combustion, as well as by the double lambda sensor that creates a uniform mixture at the cylinders in any operating conditions, consequently improving consumption and harmful emissions. All this verve is controlled by a benchmark braking system for the category worthy of a sports motorcycle, comprising a trio of large diameter discs and four-piston front callipers and radial connection that is painted red to highlight the MGX-21’s exhibitionist personality. The suspension system also boasts quality elements: the powerful fork with 45 mm diameter stanchions works with a pair of rear shock absorbers that have adjustable hydraulics in extension and spring preload through the convenient remote hydraulic preload. Only by using noble materials, such as aluminium and carbon and through the best processing procedures, Moto Guzzi has created a range of prestigious accessories with the goal of elevating, not only comfort and riding pleasure, but also the exclusivity of the MGX-21, creating a truly unique level of personalisation. 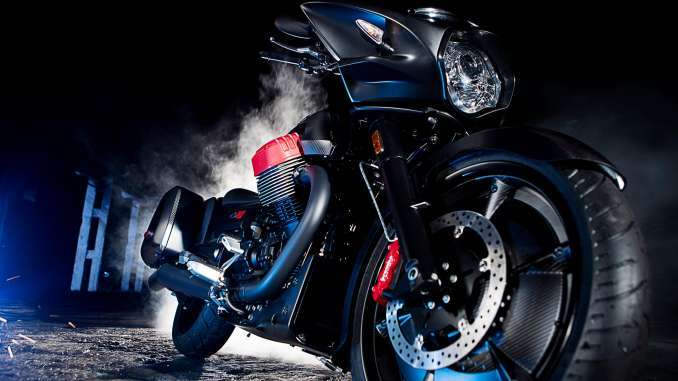 All of the parts have been conceived, designed and developed by Moto Guzzi and they are subjected to strict control test cycles just like any other original part on the bike in order to guarantee a quality and long-lasting product. Since they have been conceived and fine tuned by Moto Guzzi they are perfectly interchangeable with the factory parts, allowing you to easily revert your bike to its original configuration. They are also fully approved and therefore absolutely “street legal”. Oversized top fairing: improves air protection, at the same time accentuating the unmistakeable style of the MGX-21 Batwing. Black brake lever: made from billet aluminium, it can be adjusted to 4 positions. GPS/smartphone bracket: black anodized aluminium bracket. Allows easy installation of the smartphone or GPS case. Pair of LED lights: the energy saving LED lights, with their aluminium bodies and reduced dimensions, integrate perfectly on the bike and allow greater visibility and safety during night riding. Carbon fuel tank cover: this gives the MGX-21 command centre even more precious and aggressive. Carbon injector covers: lightweight and elegant. A touch of class in attention to detail. Cylinder heat guards: made of stainless steel, they improve riding comfort, protecting the rider from the engine heat. Driver and passenger footrest cover: made of black anodized billet aluminium, these give the bike an aggressive look, also improving the riding feel. Rear brake lever cover: made from black anodized billet aluminium, this is easily installed on the flatboards lever. Swingarm washers: made of billet aluminium, these are installed at the ends of the swingarm pin. Carbon passenger seat cover: created specifically for “lone travellers”, this is installed in place of the passenger saddle. Carbon luggage rack: blending well with the aggressive line of the bike, this is easily installed in place of the passenger saddle. Rear suspension swingarm with dual shock absorbers, adjustable rebound and hydraulically adjustable preload. Electronics Ride by Wire with 3 engine maps, 3-level traction control, standard cruise control.